Scales provide the foundation for understanding harmony and learning the 12 major scales is a fundamental step in learning jazz piano. When we play a piece of music using the notes of a particular scale, we say that we are playing in that key. For example, if we are playing a piece of music using just the notes from the C major scale, we are playing in the key of C.
Download this free PDF containing the major scales in all 12 keys. All of the major scales contain 7 notes. However, you will also come across scales that contain 5, 6 and even 8 notes — more on these in other lessons. The most effective way to learn the 12 major scales is through using the circle of fifths. 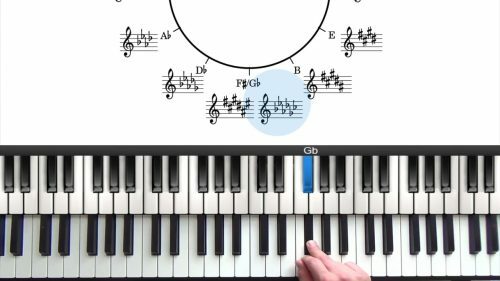 The circle of fifths is a handy diagram that shows which keys are most closely related to each other on the piano. If you are just starting out with jazz piano scale study, the first step is to learn the 12 major scales. Many interesting sounding modes can be derived from the major scale and so spending adequate time to memorise them will give you strong foundations for further scale study. We introduce the major modes, explaining what they are and where they come from. These 7 modes play a fundamental role in improvisation. If you don’t have these 12 major scales completely memorized then you should be working on them every day until you do. This is important so don’t skip this. It’s very important to learn the major scales numerically. Learn the notes of each scale as 1-2-3-4-5-6-7 and back to 1. Here is a useful tool built by one of our students - it tests you on your numeric understanding of scales and you can do this away from the piano. Very useful for beginner jazz students. Learning the scales numerically is essential for your study of more advanced harmony. Test yourself whilst away from the piano. Ask yourself: "what's the 4th of Ab Major" or "what's the 6th of D Major"... if it take you longer than a second or 2 to get the answer, then you don't know your scales numerically! When you're next at the piano, revisit that scale and learn the numbers. In jazz, it's far more effective to think in terms of numbers than actual note names. The numbers give you the formula to apply the chord, scale, voicing, lick or line to any key. It's basically a shortcut.